If you’re looking to get the best dog food for boxers, it’s important to understand this large breed’s unique dietary needs and the types of proteins and nutrition that will help your boxer puppy or adult grow strong and healthy. Furthermore, if you’re buying food for Boxer puppies or Boxers with skin allergies and sensitive stomachs, even more care must be given to picking a top-rated dry dog food. But with so many different dog food brands in the market, it can be a challenge to find honest reviews about the best foods for the Boxer breed. From tips on feeding Boxers to common health problems and allergies to be aware of, we’ve covered everything you need to know about what makes a good dog food for a boxer and how to approach buying your Boxer food from the top brands. You can also check out our guide to find recommendations on the best puppy food for Boxers, as well as the results of our research on top-rated companies and products for Boxers in all stages of life. 5 What Makes A Good Dog Food For Boxers? With their wrinkled faces and clownish personalities, Boxers are a playful breed and an excellent family pet. These beautiful dogs are known as much for their friendly temperaments as for their loyalty and courage. It is no wonder that this is one of the most popular dog breeds in the United States. Though Boxers make wonderful pets, they can sometimes be stubborn and tricky to train. In addition to requiring a firm and consistent hand in training, Boxers also require a healthy and balanced diet to ensure a long, happy life. Below, you’ll find some helpful information about Boxer diet and nutrition as well as some tips for choosing a dog food and recommendations for dog food brands. Feeding your Boxer a nutritious diet is the best way to keep him healthy for the long-term. What you need to realize, however, is that not all dog foods are created equal, and your Boxer has some specific nutritional needs that must be met through a healthy diet. Generally speaking, dogs need a balance of protein and fat in their diets as well as an assortment of vitamins and minerals. All dogs have the same basic nutritional needs in terms of minimum requirements for these nutrients. An adult Boxer needs a minimum of 18% protein in his daily diet to support his lean muscle mass. The best protein sources for dogs are animal-based – foods like poultry, meat, and fish. Animal-based proteins are important because they are complete proteins, which simply means that they contain all of the essential amino acids your dog’s body can’t synthesize on its own. A high-quality source of animal protein should be the first ingredient in any dog food product you choose. In addition to plenty of high-quality protein, your Boxer also needs healthy fats in his diet – a minimum of 5%. Fats provide a concentrated source of energy for dogs as well as fatty acids that promote skin and coat health, immunity, and more. Your Boxer doesn’t have specific needs for carbohydrates in his diet, but they can provide essential nutrients and dietary fiber – just make sure they come from high-quality sources that are digestible for dogs such as whole grains and vegetables. While your Boxer is young, you may want to feed him three meals a day to make sure he gets enough food to support his growth and development. In adulthood, however, it is recommended that you feed your Boxer twice a day – once in the morning and once in the evening. Because the Boxer grows to over 50 pounds at maturity, he technically qualifies as a large-breed dog and should be fed a dog food formulated for large breeds. These recipes are made with plenty of protein to sustain your dog’s lean muscle mass with limited fat content to control calories. To determine how much to feed your Boxer, refer to the feeding recommendations on the package because each recipe is different in terms of calorie content – you’ll need to determine your dog’s daily portion based on his weight and age. All dogs are prone to certain health problems, but the Boxer has a fairly long list of inherited conditions. Some of the leading health problems for the breed include cancer, cardiomyopathy, hypothyroidism, hip dysplasia, generative myelopathy, gastric dilation volvulus, and various eye problems. If your Boxer suffers from any of these issues, you may need to make adjustments to his diet. For example, if your Boxer has hypothyroidism, supplementing his diet with iodine may benefit his thyroid health. In addition to watching what your dog eats, you should also be mindful of how he eats – gastric dilation volvulus is a condition that affects deep-chested breeds and can be exacerbated by eating too quickly or eating too much at one time. What Makes A Good Dog Food For Boxers? There is an endless array of options out there for dog food, so choosing the best dog food for your Boxer can be a challenge. To choose a high-quality product, you’ll need to read the food label to make a comparison between different options. As you do, keep in mind what you learned about your Boxer’s nutritional needs in the previous section. When it comes to choosing a dog food for your Boxer, the most important parts of the label to focus on are the guaranteed analysis and the ingredients list. The guaranteed analysis will tell you the percentages of crude protein, fat, and fiber in the product, so you can make a direct comparison between different formulas. Remember, your Boxer needs a minimum of 18% crude protein and 5% crude fat in his diet. The ingredients list for dog food products is arranged in descending order by volume – ingredients used in the highest volume are listed first. When reviewing the ingredients list, you want to see a high-quality source of animal protein at the top of the list – if you see a carbohydrate or a non-specific protein (like poultry meal), move on to another product. You’ll also want to see healthy fats like chicken fat or salmon oil on the list because these ingredients provide a concentrated source of energy for your dog as well as essential fatty acids. Carbohydrates are not a necessity in dog food but, if they are included, make sure they come from digestible sources. Moreover, keep an eye out for beneficial supplements like probiotics and chelated minerals. When shopping for dog food for your Boxer, you need to choose something that will meet his energy requirements as well as his nutritional needs. The best place to start is with a large-breed formula. Here are the best dog foods for Boxers. 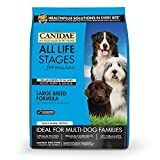 Made with turkey meal, a concentrated source of complete animal protein, this Canidae All Life Stages Large Breed Formula is a great option for your Boxer. It contains 23% crude protein and 13% fat as well as plenty of beneficial supplements including chelated minerals and probiotics. Additionally, it is completely free from gluten, corn, wheat, and soy. As an added bonus, this formula is uniquely designed for multi-dog families to ensure that all of your dogs get the nutrition they need. Made with farm-raised chicken, brown rice, and sweet potato, this Nutro Wholesome Essentials Large-Breed Adult recipe is the perfect choice for your Boxer. Not only does it contain 21% protein and 13% fat, but it is packed with digestible carbohydrates, healthy fats, and beneficial supplements. It is rich in glucosamine and chondroitin to protect your dog’s joints as well as chelated minerals to ensure maximum nutrient absorption. Plus, it is free from artificial additives and GMO ingredients. 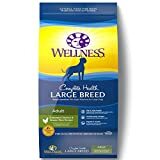 Available in both an adult and puppy recipe, this Wellness Complete Health Large-Breed Formula is packed with protein from both fresh chicken and chicken meal as well as salmon meal. It is loaded with healthy fats like chicken fat and flaxseed, plus plenty of beneficial supplements like chelated minerals and probiotics. You’ll also be glad to know that it contains fresh fruits and vegetables as natural sources of key nutrients and the recipe is free from corn, wheat, soy, and artificial additives. Finding the best puppy food for Boxers can be even more difficult. As a puppy, your Boxer needs plenty of calories to fuel his growth and development, but you do need to make sure he doesn’t grow too quickly. Rapid growth in large breeds can increase a dog’s risk for developing musculoskeletal problems later in life. In terms of nutritional requirements, Boxer puppies need a minimum of 22% protein in their daily diet as well as a minimum of 8% fat. The best way to ensure that your Boxer puppy’s nutritional needs are met without risking overgrowth is to feed him a high-quality puppy food formulated for medium- to large breeds. Here are our recommendations for the top dog food brands for Boxer puppies. A unique combination of high-protein kibble and freeze-dried raw bites, this Instinct Raw Boost Large Breed Puppy formula is packed with nutrition and natural flavor. Not only does it contain 33.5% crude protein, but the first two ingredients are high-quality sources of animal-based protein – fresh chicken and turkey meal. In addition to being packed with protein and healthy fats, this recipe contains probiotics for healthy digestion, and it is completely free from grains, corn, wheat, and soy as well as artificial additives. Specifically designed to support the growth and development of large-breed puppies, this Orijen Large Breed Puppy Formula is packed with over 11 pounds of fresh, raw, or dehydrated animal proteins in every 13-pound package. This recipe contains a whopping 38% protein and 16% fat, so you can rest assured that your Boxer puppy’s needs will be met. Plus, it is supplemented with organ meats, fresh vegetables, and chelated minerals for nutritional balance. 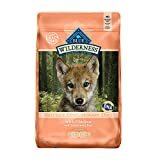 Made with fresh deboned chicken and protein-packed chicken meal, this Blue Buffalo Wilderness Large-Breed Puppy Formula is just what your Boxer puppy needs to grow big and strong. Naturally grain-free, this recipe features gluten-free carbohydrates like green peas and tapioca starch as well as plenty of healthy fats in the form of chicken fat, fish oil, and flaxseed. Plus, like all Blue Buffalo products, it is fortified with LifeSource Bits which feature a blend of vitamins, minerals, and antioxidants to support whole-body health and wellness. Finally, the most challenging prospect may be getting the best dog food for Boxers with skin allergies or sensitive stomachs. In addition to the health problems covered earlier, Boxers are definitely prone to allergies. Dogs can be affected by environmental allergies in much the same way people can, but food allergies are a more common concern for Boxers. Technically speaking, a dog can develop an allergy to any food, but some of the most common culprits for dog food allergies include beef, dairy, wheat, chicken, egg, and soy. If your Boxer suffers from food allergies, you may need to put him on an elimination diet for 12 weeks until all signs of the allergy disappear. During this 12-week period, you should feed him a limited ingredient diet (LID) made with novel sources of protein and carbohydrate – ingredients that he hasn’t eaten before which have a low risk for triggering an allergic reaction. After 12 weeks, you can keep feeding your Boxer the LID or switch him to a recipe free from his allergens. Whether you’re looking for a dog food to use as an elimination diet or simply looking for a product with a low risk of triggering food allergies, we recommend the following dog foods for Boxers with allergies. The Acana Singles line of products is made with a single source of animal protein and limited carbohydrate content. This particular recipe features grass-fed lamb in a nourishing combination of fresh meat, cartilage, and organ meats for high-quality and balanced nutrition. In addition to offering 27% crude protein, this recipe is also rich in healthy fats like lamb fat and herring oil. This recipe is completely free from gluten and grains, and the carbohydrate content is limited to fresh fruits and vegetables. Overall, this recipe is made with high-quality ingredients and formulated to meet your Boxer’s nutritional needs with a low risk of triggering allergies. Whether you are raising a Boxer puppy or caring for an adult dog, choosing a high-quality dog food formula is a must. Take what you’ve learned here to heart and use it to choose a healthy and nutritious dog food product that will nourish your Boxer’s body from the inside out. He’s your best friend, so he deserves the best!